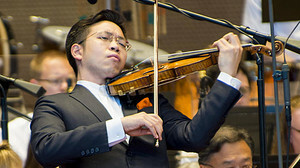 The contrast could hardly have been greater with the ensuing work, Samuel Barber’s Violin Concerto, which brought the night’s second inspiring debut from soloist Paul Huang. Winner of the 2015 Avery Fisher Career Grant, the young violinist was fully in synch with Barber’s vein of bittersweet nostalgia from his very first notes. Playing the 1742 ex-Wieniawski Guarneri del Gesu—on loan from the Stradivari Society of Chicago–Huang caressed the lyrical lines with a pure, luminous tune ideally suited to this score. Introduced by a lovely oboe rendering of the Andante’s main theme, Huang brought both spacious phrasing and fresh intimacy to this introspective music. The only slight letdown was in the finale where Huang’s rather cautious style lacked virtuosic sizzle in the moto perpetuo fireworks, though he finished with a burst of adrenaline in the closing bars. Stenz and the orchestra were simpatico partners, the conductor alertly supporting the soloist and pointing lyric climaxes with fervor.